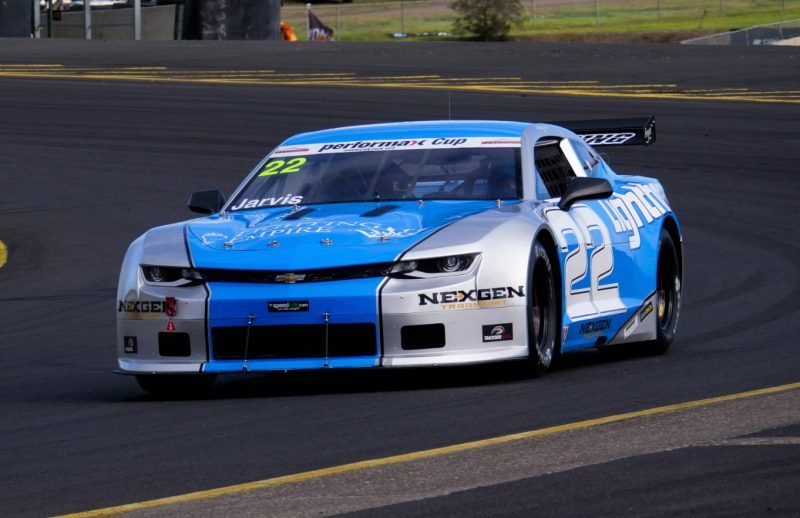 Ashley Jarvis has won the third round of the 2018 Performax TA2 Muscle Car Series at the Australian Muscle Car Masters at Sydney Motorsport Park. The Chevrolet Camaro driver scored a clean sweep of all four races to claim overall round honours ahead of Russell Wright (Mustang) and Hugh McAlister (Mustang). On his series debut, Aaron Seton (Mustang) earned pole position by 1.9 seconds over Jarvis in a very wet qualifying session, the largest pole margin in series history. Ian McAlister (Mustang) bested son Hugh (Mustang) to claim the second row of the grid for the McAlister Motors Ford team. Seton lead from the start in race one, before spinning off after turn three on the second lap, falling back to eighth before driving back through to second. This left Jarvis to win race one after building a ten second margin by the chequered flag. Peter Robinson (Challenger) battled hard to earn third place ahead of Wright and Hugh McAlister. Ian McAlister sat in third for the majority of the race, before he suffered a puncture on the final lap and dropped back to sixth. On a wet but drying track in race two, Jarvis drove away from the field to win by 15 seconds over Wright and Robinson. A gamble to run slick tyres didn’t pay off for Seton as he dropped back to 11th, with the remainder of the field sticking to wets. Jarvis took a lights-to-flag win ahead of Wright and Hugh McAlister in race three. Seton charged through the field to third, before a spin at the turn eight hairpin on the final lap while chasing Wright let Hugh McAlister past, dropping him to fourth. Seton made his way to second by lap three of the final race and hounded the back of Jarvis’ Camaro right until the chequered flag. Jarvis fended off Seton to take the win by two-tenths of a second to seal the clean sweep. Mark Crutcher (Camaro) and Anthony Tenkate (Mustang) failed to finish after Crutcher spun around at the turn eight hairpin on lap six and was collected by Tenkate. Jarvis, who maintains an unbeaten streak this season in his own car, was ecstatic with his performance all weekend. On 276 points, Russell Wright now leads the 2018 Performax TA2 Muscle Car Series by 5 points over Hugh McAlister on 271, with Jarvis moving up two spots to third on 264. The 2018 Performax TA2 Muscle Car Series heads to Queensland Raceway for round four at the 2 Days of Thunder on June 23/24.